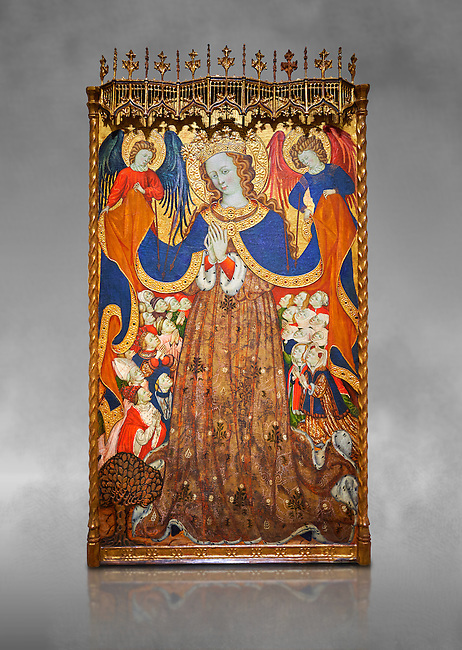 Gothic Catalan altarpiece depicting the Madonna of Mercy by Bonant Zaortiga, circa 1430-1440, tempera and gold leaf on wood, from the church of Mare de Dieu de Carrasca , Blancas, Terol, Spain. Against a grey art background. Bonnat Zaortiga was one of the most prominent representatives of the international Gothic. The Mother of God of Mercy protects humans with her cape, symbolizing one of the most feared evils of the European Middle Ages, plague, often understood as a punishment for the sins of mankind. This was the central panel of the altarpiece of the church of the Mother of God. National Museum of Catalan Art, Barcelona, Spain, inv no: MNAC 3945.